The North Atlantic Treaty Organization (NATO) has arguably been the most utilized tool of imperial war since the Soviet Union fell in 1991. Ironically, the sole purpose of NATO’s creation in 1949 was to “contain” revolutionary socialism wherever it emerged. The world was a very different place in 1949. The Soviet Union had developed into an industrialized, socialist state with links to independence struggles all over the world. 1949 was also the year of the Chinese Revolution. These developments pulled nearly a third of the world’s population out from imperialism’s orbit. NATO was initially imperialism’s counterweight to impede the growth of socialism around the world. After the Soviet Union fell, NATO evolved into an instrument of imperialist expansion. NATO pooled together the military resources of member nations around the interests of its most powerful members, especially those of the US. NATO has played a critical role in every US war since 1991. The alliance helped dismember Yugoslavia in 1999 and invade Afghanistan in 2001. In 2011, NATO was called on to give cover and aid to jihadists in the overthrow of Muammar Gaddafi and the independent government of Libya. Libya’s social system, which provided free healthcare, education, and full rights to women for all Libyans, was effectively destroyed. The NATO-backed destabilization of Libya provided the blueprint for the current proxy war in Syria. NATO countries have been deeply involved at all levels of the proxy invasion of the secular Syrian state since 2011. NATO’s provision of high tech weaponry, logistical support, and safe zones to jihadists has been the primary obstacle to the Syrian people’s desire for a peaceful end to the war. Millions of people have died and been displaced largely because of NATO’s refusal to withdraw from the proxy war. US imperialism’s overall agenda is to isolate and ultimately destabilize Iran, Russia and China. These states represent the emergence of a new world order guided by the principles of international law and sovereignty. Their mode of development threatens US dominance around the world. The parasitic rulers of the imperial system have calculated that a march to war with Russia and China is a necessary precondition to US dominance. The US capitalist economy has declined and rendered it unable to compete with Russia and China without the use of military means. The contradiction between US dominance and struggle for national sovereignty is evident in Russia’s intervention in Syria. The Russian Federation has largely set back NATO efforts, led by the US, to destabilize the government of Bashar Al-Assad. Russian support for the Syrian state in the form of air cover and military aid has ISIS, Al-Nusra front, and other terrorist forces on the defensive. In complete accordance with international law, Russia has helped preserve the right of the Syrian people to choose what kind of government leads the nation. US imperialism has responded with a dangerous message of imminent war to Russia. The message has been largely disseminated through NATO. In the week of November 6th, NATO concluded its largest operations to date in Spain, Portugal, and Italy. The Trident Juncture operations consisted of 6,000 troops, 230 military units, 140 fighter aircraft, and more than 60 warships from 28 participating countries. The Pentagon additionally sent F-15c jets to Turkey to allegedly to bolster the Western coalition’s efforts against ISIS in Syria. F-15c jets are meant for use in air combat. ISIS does not possess an air force. But Russia does have an air force and it is deeply engaged in airstrikes in ISIS-held Syrian territories. The US military apparatus has made clear in actions and in words that Russia is the primary target of its operations. NATO Supreme Commander Phillip Breedlove, in a recent Department of Defense briefing, explained that Russia’s “build up” in Syria and “aggression” in Crimea made NATO escalation in Europe a necessary measure to protect Western “security” interests. NATO’s Trident Juncture operations also included exercises with African Union troops across the continent. He justified NATO collaboration with AFRICOM as a safeguard for nations such as Libya from potential Russian incursion. The thought of NATO “protecting” Libya is an absurdity. NATO left Libya destroyed and under the rule of competing terrorist fractions. 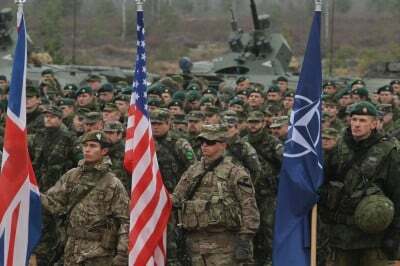 What NATO’s collaboration with AFRICOM actually shows is that the US-NATO alliance is in deep preparations for war with Russia on all possible fronts. NATO expansion into the Middle East, Africa, and Europe has greatly increased the possibility of an armed confrontation between the US and Russia. China is also a large part of this equation, especially in Africa and the Asia Pacific region. The prospect of a World War III scenario grows each day US imperialism exists on earth. US military aggression, spearheaded by NATO, must be seen as the development of a seek-and-destroy policy of any and all forces that stand in its way. Russia and China are two of the biggest forces standing in the way of imperialism’s goal of full spectrum dominance. The only force that can prevent the continuation and expansion of the US warfare state is the force of the people. The force of the people must be consolidated into a mass movement based on the material interests of all oppressed people in common opposition to imperialism. Such a movement needs to condemn police brutality, racism, and exploitation just as staunchly as it condemns the brutality of the US warfare state on Syrians, Russians, Iranians, and the like. This requires an understanding of the root causes of police brutality, war, and poverty. Only an organized people can push forward a broad, public conversation with the masses around the question of imperialism. Danny Haiphong is a candidate for Workers World Party and member of Fight Imperialism Stand Together in Boston. He is also a regular contributor to Black Agenda Report. Danny can be reached at [email protected] and FIST can be reached at [email protected].